This is mainly an offer to trade, simply because I've already poured so much cash into this project that a reasonable person would question my sanity. But if you were the kind of person who would do that, you wouldn't be reading this page. So . . .
 I have some extra Cross Bone Clippers, Armada Flagships and Red Beard Runners still in the box, and maybe someday I'll trade them if I don't use them to enlarge the fleet.  Old Castle and Space minifigs -- various, all the way back to Classic. I have not organized these yet, but offer me a neat trade and make it worth my while to find out what I've got.  Horses, saddles and so on.  Barrels and treasure chests.  Duplo "Brontosaurus" adult and baby.  Radar dishes in various colors and sizes, mostly gray.  1x1, 1x2, 1x3, 1x4, 1x6, and 1x8 bricks in all the classic colors.  32x32 Paradisa beach baseplate.  "Double river" 32x32 blue baseplate.  Classic Space baseplates with the two craters.  A couple of 4.5v motors and battery holders that I got in a trade. I'm not sure what they were originally for.  A couple of old "fireboat" floating hulls, in far from new condition.  Wagon wheels (both sizes).  Islanders stuff: red Kahuka masks, white wheels of accessories.  Unopened packages of old-style (gray) crossroad road plates.  And I have all kinds of other bits, plus a few old and not-so-old sets still sealed in the box for trade purposes, so feel free to ask about the particular thing you are looking for. In general, I'm interested in any figures, scenery or other elements that can be used to build islands and ships to enlarge my Pirate Game, and I've recently become interested in Train/Monorail stuff. 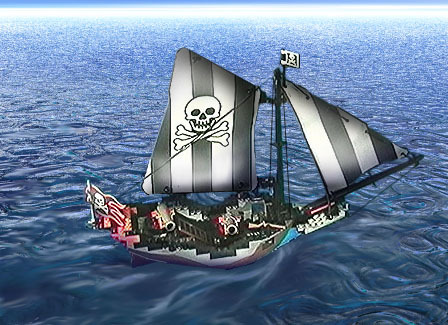 Jump to the bottom for a few other non-Pirate items that I'm looking for. Just getting started here; if you have any train or monorail stuff that you want to swap, let me know and we'll talk. Used is OK, if it's in good condition, because this is to be played with, and I don't care about the box. Here's a weird one: if you have a burned-out monorail motor, I want it. Some of these are new introductions; others are just things I haven't seen before, or just now figured out I could use . . .
 The OLD style Lego gears; the big one is red, next is blue, then yellow, and the small one is white.  Any minifig torso or other imprinted piece with SHELL or EXXON on it.  16 x 16 gray "dock" pieces from railroad sets; actually, I'm okay on ramps now, but I'd like a few more instances of the flat dock.  Large rowboat. 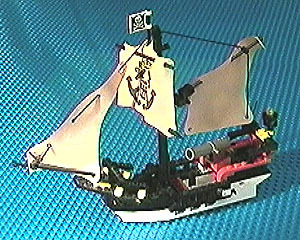 The 1999 Adventurers sets have brown ones; Belville has had yellow ones for a while. Either would do.  The regular seaweed from Divers sets.  Islanders, complete or just the torso (I need a couple more torsos)! I'd especially like more Islander Babes. And it would be interesting to get a few of the "Amazon native" figures from the 1999 Adventurers sets. A rival tribe, maybe? 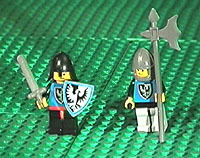  "Black Falcon" minifigs, non-piratical though they are, because I like them . . . in the game, they will become the noble Ruritanians. (You never heard of Ruritania? Shame on you.) To the right you'll see a couple of Black Falcons bravely guarding their native baseplate.  Soldiers: "redcoats" and especially "bluecoats." Not the modern ones, but the old ones, because that's what I've got now.  Triangular pirate hats in either black or brown.  Pirate head-scarfs in any color - but I prefer blue, and would really like more in BLACK. I'll trade the skull-and-crossbones pirate hats for any other kinds of pirate headgear, one for one.  Black soldier "shako" hats.  Mummy heads. I want to create some Deep Ones for the game . . .
 White female hair, or any color pigtails.  Neckerchiefs, in colors other than black.  The round Paradisa 2 x 2 with the crab on it.  A couple more GRAY crocodiles. I have green ones coming out my ears, and let me tell you, it looks really silly.  Belville sea creatures . . . the crab, the shell and so on.  DUPLO dinosaurs for Dinosaur Island, in the new colors - red pterodactyls, purple T. rex.  DUPLO decorated 1 x 2 x 2 with fish on them (for the fishing boat).  Central hull sections, any size and color. Building Pieces, as in "pieces for buildings"
 Octagonal red roof pieces, hinged or otherwise (if there is an otherwise). The hinged ones are seen in 6035 and 6082.  1 x 5 x 6 yellow walls, especially those with "bricks" showing through, and those with window openings.  Quarter-octagon white and yellow walls, also called wall-corners, especially with red "bricks" showing.  1 x 4 log wall pieces in white, brown or gray.  1 x 2 log wall pieces in white or gray.  Red plates 6 x 8 or larger, for roofs.  Yellow 1 x 3 x 3.3 "5-Studded-Hypotenuse Bricks".  White, brown or black 2 x 2 rounds.  3 x 3 or 5 x 5 diagonals in white.  6 x 8 slanted roof (or ramp) pieces in any color.  Fence sections -- the big "picket fence" pieces -- in any color.  1 x 6 x 6 white walls, especially those with "bricks" showing through, and those with window openings.  The 32 x 48 double-hill-and-river baseplate from 5986, Amazon Ancient Ruins.  Large or half-sized tan baseplates, decorated or not.  Any blue baseplates with islands or coastline on them.  The three-leaved "philodendron" plant, and the prickly bush BASE.  Old-style palm trunk sections (for Islander buildings).  Silver bricks -- I could use one or two more as BIG treasure.  Gems. I have a couple of yellow-green; what other colors are there?  BLACK barrels and BLACK treasure chests.  4 x 3 x 2 brown stackable crates.  Minifig suitcases, any color.  Anything else unusual that could work as "cargo" -- no ordinary chests or barrels, please -- let me know what you think of! I really like the little ship (right) that came with the Imperial Trading Post, and would trade for more of those. I am looking for instruction booklets, with stickers, in all languages except Dutch. I have several Dutch ones to trade. Note that the Dutch sticker book contains a wide variety of advertising stickers for the stadium. I've been told that the other languages' sticker books have nothing but Shell and Lego stickers for the grandstands. I have a complete extra stadium set, new in box, which I'll eventually sell or swap . . . and over and above that, some extra light towers. Serious offers only on this stuff!